"This deliciously different dish incorporates a classic combination of flavors: lemon, chicken, and garlic. A nice change of pace from the usual pasta fare." Preheat oven to 350 degrees F (175 degrees C). Place chicken in a lightly greased baking dish. Squeeze lemon over both sides of the chicken breasts and season both sides using 1 1/2 teaspoons garlic powder and 3/4 teaspoon pepper. Bake for 40 minutes, or until juices run clear and chicken is no longer pink inside. Meanwhile, in a large saucepan, season the chicken broth with the remaining 1/2 teaspoon garlic powder and 1/4 teaspoon pepper. Bring to a boil and add lemon juice and pasta. Cook over medium heat, stirring occasionally, until all liquid is absorbed, about 25 minutes. 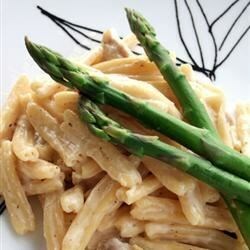 Cut cooked chicken into bite-sized pieces and stir into cooked pasta, along with the cream and lemon zest. Cook, stirring, over low heat for 5 minutes. Remove from heat and let stand 5 minutes. Stir thoroughly before serving. Amazing!!! Did not change a thing and it was perfect.